Whether you're traveling on Washington's urban arterials, the highways or the backroads, it's a good idea to find out about road conditions before you head out on a road trip of any length. Check an app or check a website, but either way, stay up to date (apps and websites are listed below). Any number of things can go wrong and mess with the flow of traffic, and they often do. 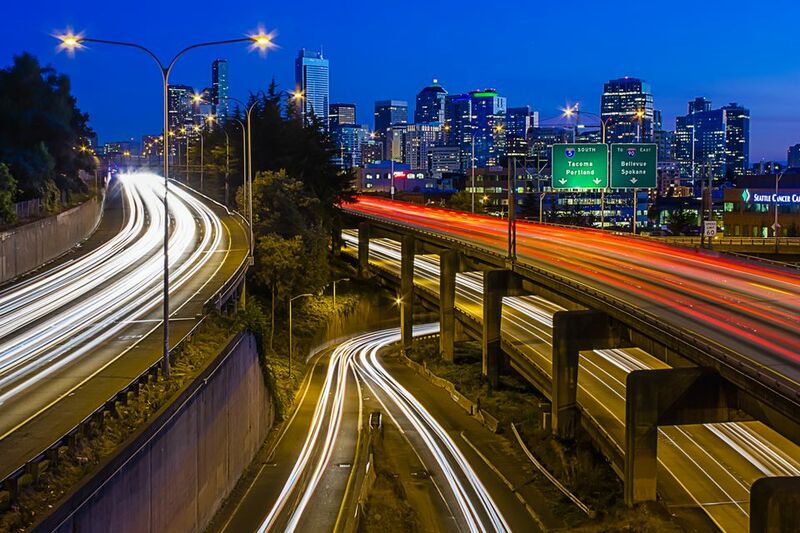 While you can't change the fact that bigger cities like Seattle are just going to clog up with traffic sometimes, checking ahead helps you plan an alternate route, or at least know what's coming. Beyond traffic, road conditions such as rock slides, forest fires and even construction are not unusual, especially in warmer months. On the flip side, winter brings icy mountain passes, flooded valleys, mudslides, and avalanches. And any time of year, it could be a big concert or sporting event, or an accident or crime scene that impacts transportation on Washington roads. Here are some resources to help you learn about the latest road conditions in Washington state, from travel alerts and sudden changes, to scheduled construction, to mountain pass conditions, to regular run-of-the-mill traffic. Nothing beats having access to the latest road conditions from the moment you sit down in your vehicle. These phone apps will give you real-time information. The WSDOT App: You can find the WSDOT app in the Google Play or App Store. It's a handy central resource for the full range of traffic and road conditions in Washington State, including traffic maps, mountain pass reports, ferry wait times and status, border wait times, and toll rates. WAZE: WAZE took the traffic map and elevated it, using real-time traffic updates from other drivers to help you avoid problem spots or find shortcuts. Just be careful using it as using your phone while driving is a ticketable offense in Washington. You can, of course, use Google Maps or Apple Maps (or most other cell phone map apps) and their traffic features as well. Travel Alerts and Slowdowns: Organized by location, highway, and impact level, this Washington State Department of Transportation (WSDOT) travel alert web page provides the latest information about anything related to roads, construction projects, and traffic flow in Washington State. Click the map to zoom in by region or by city. WSDOT Email and Text Alerts: You can sign up for email or text alerts from WSDOT and customize the alerts you receive by commute route, ferry route, and more. King County Road Alerts: Up-to-date information about anything that might close or restrict King County roads and bridges. King County Road Alerts Text or Emails: If you have a route you travel frequently in King County, you can sign up for alerts to come straight to your phone or email. You can also follow King County Roads on Twitter or Facebook for updated alerts. Washington Road Construction Projects: Use WSDOT's travel alerts page for any kind of alert, but to check out planned construction projects, check this one out. Information about current road construction projects is broken down by region and county. King County Road Construction: Find out about the road and bridge construction projects underway or planned in King County. WSDOT Mountain Pass Reports: If you're traveling between Western and Eastern Washington, always check the pass conditions. Will you need chains? Is the highway icy or dry? Is it even open? Click on the interactive map to get current pass reports, webcam views, weather conditions, and information about any restrictions. You will also find information about mountain pass closure and opening dates, snow accumulation, and avalanche dangers. Alternately, you can follow WSDOT Passes on Twitter. Avalanche Forecasts: The Northwest Weather and Avalanche Center provides the latest information about snow accumulations and avalanche dangers along Washington's mountain roads and highways. Statewide Traffic Cameras: A detailed list of all the traffic cams in the state, listed by freeway, highway, road, or intersection. This includes everything from traffic cams in the heart of Seattle to smaller town cams. Seattle Area Traffic: WSDOT's color-coded, real-time map lets you know how traffic is currently flowing throughout the Seattle region - green is good, red is bad, and black is really really bad. Clickable camera icons allow you to get current webcam views from specific locations. King County Traffic Cams: Live webcam views of key roads and intersections throughout Seattle and King County. Canadian Border Traffic and Wait Times: Current northbound wait times and traffic flow, including webcam views, are provided for the Canadian border crossings at the Northwest corner of Washington state. Wait times can vary pretty widely so this is an important one to check if you're heading in or out of Canada. Bottom line: Know before you go! You'll save yourself a lot of potential stress and your trip will be that much more enjoyable.